Spring is here (at least officially) and it is always a good time to remind ourselves of how to safely handle eggs. Whether you are hard-boiling them for an Easter or Passover celebration, or looking forward to serving deviled eggs at your family picnic, it is important to follow food safety guidelines. It wasn’t all that long ago that we thought that uncracked eggs were essentially sterile (inside the egg). But, numerous foodborne disease outbreaks that were sourced back to eggs in the 1970s and 1980s sounded an alarm bell. Maybe the problem was actually Salmonella (a pathogen commonly associated with eggs) IN the egg, not only on the surface of the eggshell. The implications of this new thinking would have a great impact on how eggs are handled by the foodservice industry. If the Salmonella was in the egg, then simply cleaning the shell surface would not reduce the risk of illness from egg-containing menu items such as eggnog, soft-boiled eggs, some custards and other raw or partially cooked egg-containing foods. Salmonella enteritidis (SE) is a common illness causing strain of this pathogen. It is often associated with eggs. From 1998-2008, the Centers for Disease Control (CDC) recorded that 60.3% of all SE outbreaks were traced to eggs as the source. How does SE get into the egg? There are potentially two ways for this pathogen to get into an egg. First, since Salmonella is an intestinal pathogen, chicken manure can be one source of the problem. Chicken pass eggs through the vent—the same way they poop out waste. Therefore, it is easy for chicken manure to some in contact with the surface of an egg. This can happen as the egg is laid, or if the egg comes into contact with the manure after it is laid, or rodent feces in the barn, or from other contaminated places in the farm environment. Fresh shell eggs are protected by the “bloom” or “cuticle”, a gelatinous covering that dries after the egg is laid and helps to seal the pores in the egg shell. This is a natural covering that keeps moisture in and helps to keep bacteria out. Some customers may ask for unwashed eggs, thinking that this will mean a safer egg. Commercially, eggs are often washed and/or sanitized prior to sale. Careful handling and refrigeration of eggs after washing helps to insure against cross contamination and the risk of pathogen growth. A bigger problem, that is less amenable to environmental controls occurs when a hen’s ovaries for infected with SE. An infected chicken may look completely healthy—and so will her eggs. A Federal Egg Safety rule went into effect in July 2010. Many provisions of the rule were aimed at reducing the risk for Salmonella infected birds. They also addressed environmental controls to minimize the pathogen in the hen house. Each operation must register with the US Food and Drug Administration (FDA) and have a written SE Prevention Plan. Some provisions of the rule address the monitoring and reduction of SE during the raising of pullets, or young hens. Other provisions address biosecurity, control of rodents and other pests, environmental sampling and testing, cleaning and disinfection of the hen house, egg sampling and testing, and refrigeration. Eggs must be held and transported at or below 45°F beginning 36 hours after laying. The rule also exempts any operation with fewer than 3,000 laying hens and any farmer who sells all of his/her eggs directly to the consumer. These operations do not need to register with FDA, develop a prevention plan or keep records of cleaning or sanitizing operations. No matter where you buy your eggs—from the farm or the supermarket, make sure that the eggs are refrigerated, clean and uncracked when you buy them. Be sure to refrigerate the eggs quickly after purchase. And, cook eggs until yolks are firm, and cook foods containing eggs thoroughly. It is important to handle eggs safely to prevent illness. When buying eggs, buy shell eggs only when sold from a refrigerator or refrigerated case. In Connecticut supermarkets, eggs must be held at temperatures no lower than 45°F. Open the carton, and make sure that the eggs are clean and the shells are not cracked. 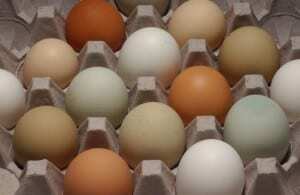 Check “sell-buy” dates so that you are getting the freshest eggs. Sell-by dates are an indication to store owners when to pull the product from the shelves. This does not mean that the food is no longer safe to be consumed. Eggs are safe to eat when stored properly up to 4-5 weeks after the sell by date. If you choose to buy pasteurized eggs or an egg substitute product (usually found in a cardboard carton) made from egg whites, be sure that the product is sold from a refrigerated or freezer case. Check “sell-buy” dates for the freshest product. Store eggs in the original carton, and refrigerate as soon as possible after purchase. Be sure that the temperature in your refrigerator is 40°F or below. Eggs are washed and sanitized before they are packed. Eggs should not be washed before storage because you may remove the natural coating on the shell that protects the egg. When preparing eggs, keep in mind that there is always a chance that they could be contaminated with bacteria. Wash your hands and all utensils, counters and cutting boards with hot water and soap before and after preparing eggs. Do not prepare raw eggs near ready-­to-eat foods like salads, cooked meat or fish, bread, rolls or fresh fruit. Use only clean, unbroken eggs. Discard dirty or broken eggs. Cold temperatures will reduce the chance that bacteria will multiply, so keep shell eggs, broken-out eggs or egg mixtures refrigerated before and after cooking. Do not leave eggs in any form at room temperature for more than two hours including prepa­ration time and serving. For picnics or outdoor parties, pack egg dishes with ice or a freezer gel pack in an insulated cooler or bag. To prevent the contamination of other foods with the bacteria found in raw eggs, wash your hands, utensils, equipment and work areas with hot, soapy water before and after using eggs or making egg-containing foods to prevent cross-contamination. To keep prepared egg dishes safe, refrigerate leftovers in shallow con­tainers immediately after serving so that they will cool quickly. Use left­overs within two days. When eggs are fully cooked, bacteria, such as Salmonella, will be killed. When you cook eggs until the yolk and white are firm, you can be sure that they are safe. When eggs are the ingredients in fully cooked baked goods, you may also be sure that the bacteria have been killed. However, when eggs are ingredients in casser­oles, quiches, sauces or custards, it is best to use a thermometer to make sure that the food is cooked to at least 160°F. If you like to eat eggs that are not cooked to this high temperature or if you are serving folks with compromised immune systems, you might want to consider using pasteurized egg products, often found in the dairy section or egg section of your market in a carton similar to a milk carton. Cook hard boiled eggs thoroughly. Cool quickly under cold running water or ice water, then refrigerate. Keep in mind that once an egg is hard-cooked, the protective coating is washed away. This leaves open pores – and an entry point for bacteria. Keep hard-cooked eggs in the refrigerator until ready to serve. If you are decorating your hard cooked eggs or using them for holiday activities, they should not be out of refrigeration for more than a total of 2 hours. That includes all time spent at room temperature once the egg is cooked—whether cooling, decorating, or using as a centerpiece. If hard cooked eggs are out of refrigeration for more than 2 hours (or even less time if it is over 70° F), then they must be thrown out. Eat hard cooked eggs within 5 days or so. For more information about egg safety, go to the US Food and Drug Administration web site at www.fda.gov, the US Department of Agriculture web site at www.fsis.usda.gov, or contact the Home and Garden Education Center at ladybug@uconn.edu or 1-877-486-627. This entry was posted in Agriculture, Education, Family, Food, Food Safety, Health and tagged eggs, food safety, Salmonella, UConn Extension.